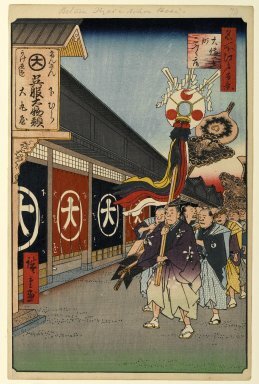 This boisterous procession is called "sending off the master carpenter" (toryo-okuri) and it followed the ridgepole-raising ceremony for a new building. Since most of the structures in Edo were built of wood, fires were frequent, rebuilding was constant, and the carpenters were among the most powerful artisans in the city. The ceremony lasted several hours, beginning with rituals conducted by a Shinto priest on a platform atop the roof of the newly framed structure, on which the symbolic items, seen here on a pole, were displayed. This sacred pole has cloth strips of five colors, paper "gohei" above, in between three fans with the rising sun symbol surrounding a mirror, below women's hair accessories, said to be symbolic of the sacrifice of a young maiden at the beginning of a large building project. Next came two ceremonial "exorcising arrows," and on the arrows are mounted large carvings of the crane and the tortoise, symbols of long life. The chief carpenter is leading the procession and he is followed by the construction bosses, each in mock samurai ceremonial dress. After the rituals, the homeowner provided a banquet with plenty of drink. The marchers, seen with open mouths, are singing a work song. In this prosperous district of Odenma-cho, at left, is the well-known dry goods store Daimaru. The storefront of Daimaru is shown in careful detail, suggesting the idea of mutual prosperity. Daimaru was a branch of a Kyoto establishment, founded in 1717 by Shimomura Hikouemon (whose family name appears on the sign here) and expanded to Edo in 1743. The shop sign to the upper left says "cash payment prices as marked"; marking fixed prices on merchandise was a practice first established in Japan as early as 1683 and Daimaru followed competitively. It has been said that fixed pricing made all customers equal and that an egalitarian mass society had begun to emerge in Edo far earlier than anywhere else in the world. Today Daimaru continues to thrive at its new location, right over the east entrance of Tokyo Station.